Last Sunday I had a great conversation with my friend Wendy over skype. Darwin had already gone to bed and so it was looking like I wouldn't get to see him, but then only a few minutes into our discussion Wendy heard him crying and decided to bring him out for a bit. It's always a lot of fun seeing Darwin's little face. 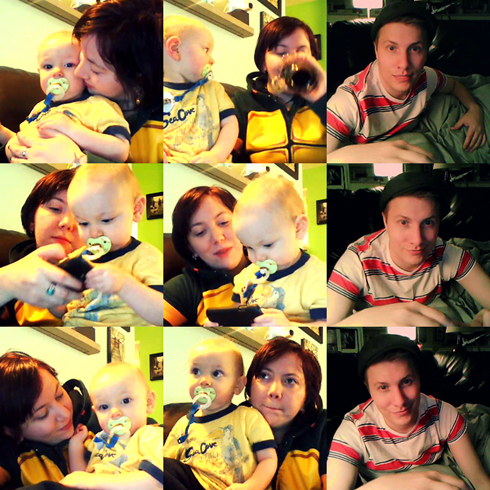 Mostly I just wanted to share a few of the screencaps I took while Darwin was chilling out with us online. As Wendy went to grab him a bottle, he gave me a few waves as he mimicked me before turning his attention back to where his Mom had gone. He's a little sound effects machine these days, and I can't wait to hear him talking soon. I just wish I were closer so that I could wrestle him and play with his toys like we did last time. For now, the skype calls go a long way.